Kilian, Crawford. 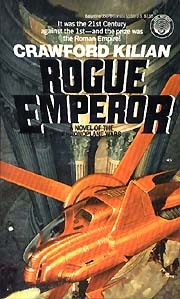 Rogue Emperor . Ballantine/Del Rey 1988. Comments: Series containing The Fall of the Republic , Rogue Emperor and The Empire of Time , all featuring Intertemporal Agent Jerry Pierce. Allohistorical content is variable, with Rogue Emperor being the most explicit. Summary: Mental Trainables of 1998 use information gained from the future of a similar timeline to speed up the end of an American Emergency. Series note: First volume in The Chronoplane Wars. Published: Ballantine/Del Rey 1987 (0345342739BUY); Legend 1988 (0099588900); iUniverse.com 1998 (1583481214BUY). Summary: Intemporal Agent Jerry Pierce investigates the assassination by antitank weapon of the Roman emperor Domitian in 100 CE of another timeline, and discovers a plot by Christian Militants to take over the Roman empire. Series note: Second volume in The Chronoplane Wars. Published: Ballantine/Del Rey 1988 (0345350782BUY); iUniverse.com 1998 (158348017XBUY). Summary: Pierce tries to find out how disaster struck Earth in the future, visiting alternate Earths along the way. Series note: Third volume in The Chronoplane Wars. Published: Ballantine/Del Rey 1978, 1985 (0345325281BUY), 1987 (0345347595BUY); Legend 1988 (0099588803); iUniverse.com 1998 (1583481206BUY).